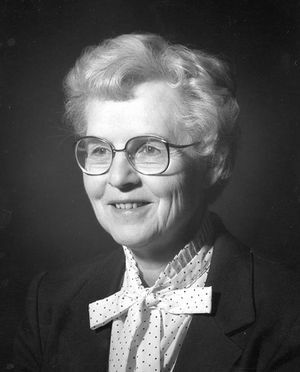 Featured Article: "Wiebe, Katie Funk (1924-2016)"
Katie Funk was born 15 September 1924, in Laird, Saskatchewan, Canada to Jacob Funk (11 July 1896-7 May 1986) and Anna (Janzen) Funk (11 March 1895-5 March 1994). They were Mennonite immigrants from Ukraine. The fourth child and third daughter in a family of five children, Katie grew up in Blaine Lake, Saskatchewan, where her father managed the local grocery store. While Katie called herself a Christian, she reflected later that she wasn’t really a disciple until she had a profound encounter with God at the age of 19 just before she left for Winnipeg to attend Mennonite Brethren Bible College (MBBC). When Katie began working for a student publication, she met its new editor, Walter Wiebe (3 October 1918-17 November 1962), a student from Yarrow, British Columbia. They were married on 21 August 1947 in the Saskatoon Mennonite Brethren Church. The Global Anabaptist Mennonite Encyclopedia Online provides reliable, freely-available English-language information on Anabaptist-related congregations, denominations, conferences, institutions and significant individuals, as well as historical and theological topics. Secular subject articles from an Anabaptist perspective and full-text source documents are also included. If you would like to make a donation to help sustain GAMEO in its mission to provide reliable information about the whole spectrum of Anabaptists we'd be glad for your help! Clicking on one of the images to the right will take you to the Mennonite World Conference donation page for credit cards in either U.S. or Canadian currency. Go to the bottom of the page to donate to "Other Project" and fill in "GAMEO" as the project to be supported. The volunteers who help GAMEO continue to exist thank you for your support! If you have specific corrections to articles or suggestions that should be added to the encyclopedia send them to the GAMEO's email address at admin@gameo.org. As a volunteer organization we are unable to respond to questions on Mennonite history or genealogical questions of any kind. For questions of that type, please contact a local genealogical society, or check with a Mennonite historical library or archives. To learn more about GAMEO, click the link. As a volunteer organization we are unable to respond to questions on Mennonite history or genealogical questions of any kind. For questions of that type, please contact a local genealogical society, or check with a Mennonite historical library or archives. For a list of Mennonite historical society or archives near you, please consult the Directory of North American Mennonite Historical Agencies. This page was last modified on 21 May 2018, at 12:45.